Tackle-football Raiders Gage Rogers and Will Connally (pictured, from left) run down an opposing Cowboy during a game at the fields at Memorial Middle School. 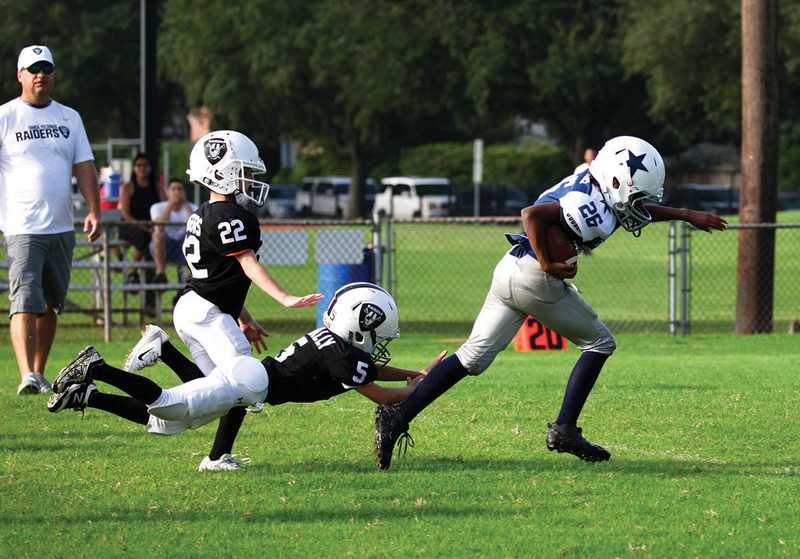 The Rummel Creek Elementary students are players on the Spring Branch-Memorial Sports Association’s freshman-tackle Raiders team, coached by Taylor Johnson, Tommy Connally, Keith Malloy, Justin Reichenau and Jason Rogers. The team began the season with an impressive 3-1 record, and the boys are looking forward to the rest of the games. The Raiders are Case Oncale, Carter Oncale, Will, Adrian Torres, Daniel Morales, Lance Malloy, Conner Johnson, Eli Dominguez, Damien Jackson, Jarrius Massey, Gage, Julian Ruiz, Graham Walker, Landry Reichenau, Kobe Reed, Caden Graham, Dylan Evans and Tanner Ball.